You basically have to turn off everything in your house to make the audio guy happy. Bad puns happen because everything’s funnier after six hours of shooting in a house without air conditioning. The sight of a field producer running around a house with duct tape covering every logo she can find is clear evidence that trademark law is ludicrous. 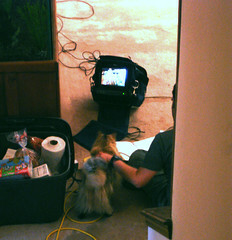 Cats make excellent assistant directors. Professionalism + Friendliness = A cool experience for everyone involved.